It turns out that interstellar plasma vibrates (so does solar plasma, but given its increased density, interstellar plasma vibrates differently). 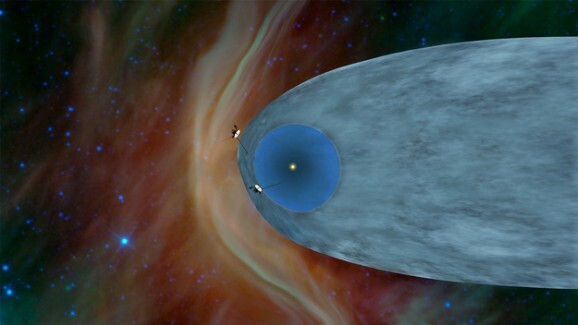 Even though its camera shut down 13 years ago to save power, Voyager I has continued to send data about cosmic particles, magnetic fields, and the plasma it’s moving through as it says sayonara to the solar system. Voyager’s plasma detector broke 23 years ago, but its plasma wave instrument has remained functional, and it recorded two instances of these vibrations, and somewhat surprisingly, humans can hear them. The plasma’s particles vibrate when they’re reached by solar flares (like the solar flare that helped scientists figure out that Voyager 1 had reached interstellar space over a year ago). Each occurrence of interstellar plasmatic vibration involved a rise in volume and pitch. As you watch the video above, you’ll see a dashed line meant to demonstrate that the change in tone follows a slope and indicates that the density of the interstellar plasma increases at a consistent and continuous rate. The density of the plasma can be measured by the frequency of the waves, and the color of the waves shows their intensity. The red are the loudest and the blue are the quietest. Given how far away Voyager 1 is, communications are a bit tough — it takes at least 17 hours for information to reach Earth from the craft. Given that the information travels at the speed of light, that means Voyager 1 has clocked some serious miles — about 12 billion. So while it may not be symphonic, or even akin to the strange and wonderful sounds of a robot orchestra, this is indeed a historical aural experience, as it’s the first time we’ve ever made or heard recordings of interstellar space sounds. How long until this becomes a Spotify channel? Keep on truckin Voyager, maybe some day we will catch up with you.